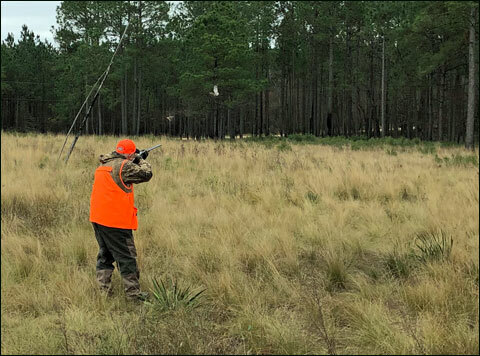 Monty Lewis called the bobwhite quail hunt a “Fellowship Opportunity,” and he wasn’t kidding. Our party of 20 current and retired board members from Ducks Unlimited and Ducks Unlimited Canada had collectively served nearly 400 years as volunteers for the revered wetlands conservation nonprofit. 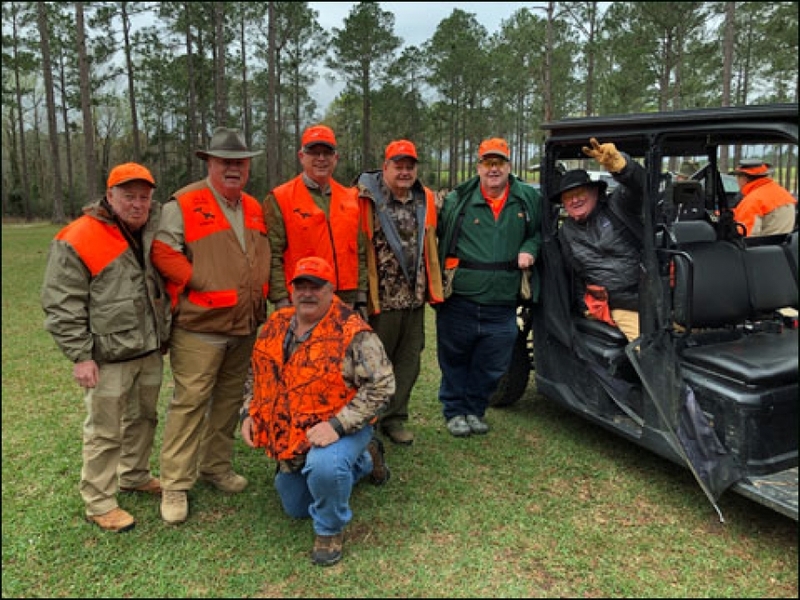 Some of the Board Members from Ducks Unlimited and Ducks Unlimited Canada on the bob white quail hunt at Southern Woods Plantation included (from left) Clay Rogers, Monty Lewis, Jim Couch, Mike Woodward, Jim Konkel, Richard Kowallik and kneeling, Joey Nicossia. I was invited as a guest of Mr. Lewis, who hosted the hunt. It followed the Joint Winter Board Meeting involving both groups in DU’s home town of Memphis, Tennessee. The agenda is comprised of goals for conserving and expanding North American duck-hunting habitats. DU and DU Canada are actually separate organizations with their own governing bodies, but they cooperate on objectives. “The Joint Winter Board Meeting is where we have an opportunity to talk about each other’s progress and challenges,” said Mr. Lewis, Retired Emeritus Board Chairman of DU who has been volunteering since 1977. 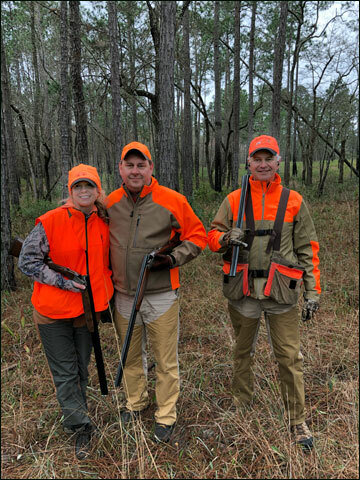 The previous two Joint Winter Board Meetings took place in Tampa, Florida and Savannah, Georgia and were also followed by Fellowship Opportunity hunts at Southern Woods Plantation. Board members pay their own expenses when traveling on DU business, so their dedication goes far beyond the time spent on events and meetings. From left: Monty Lewis, Paul Boehme and kneeling is Roger Crawford with Angel. A quick rundown of service for some DU and DU Canada members on the hunt included Jim Couch: 25 years, Bill D́Alonzo: 40 years, Jim Konkel: 40 years, Richard Kowallik: 47 years, Monty Lewis: 42 years, Joe Mazon: 30 years and Jan Young: 12 years. Thanks to the commitment of sportsmen and sportswomen such as the ones on our Fellowship Opportunity hunt, DU’s fiscal year 2017 marked the seventh consecutive year it surpassed budget goals with total revenues approaching $224 million. More than 58,000 DU volunteers hosted over 577,000 attendees at 4,050 events. Approximately 5,000 major donors and 700,000 members contributed over $86 million in philanthropic revenue – $1.8 million more than fiscal 2016. In addition to preservation through land acquisition, DU is a major force in public policy, technology innovation, education and media creation. Pam Young, Joe Mazon and Bill D́Alonzo. 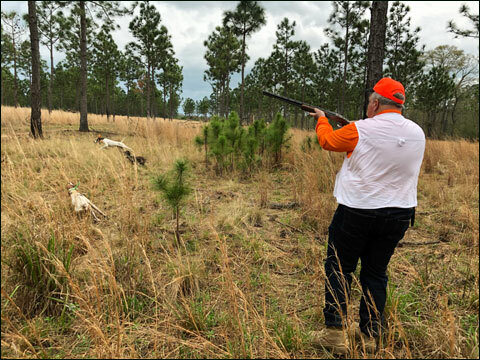 The 2019 Fellowship Opportunity quail hunt was again held at Southern Woods Plantation in Sylvester, Georgia – smack in the middle of the Southern Georgia quail belt. 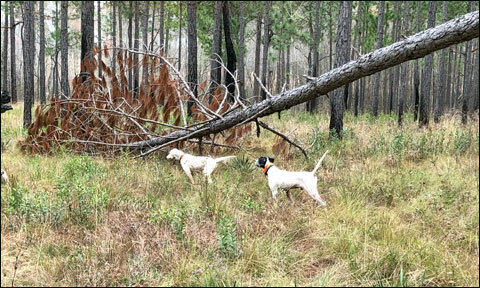 Under owner Benji Deloach, Southern Woods is precision managed with access to about 2,800 acres. Located just east of Albany, Georgia, which is home to spectacular private quail plantations and preserves, Southern Woods has 40 rooms, most with double occupancy, as its success drives ongoing expansion of the lodging. 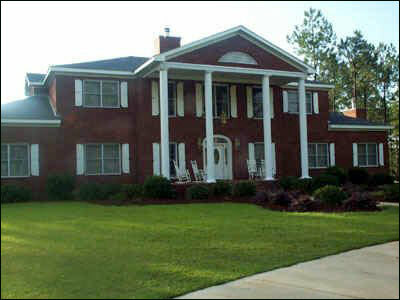 The main lodge at Southern Woods Planation. The plantation house has tall columns on the façade reminiscent of antebellum architecture. The kitchen is all meat-and-potatoes with entrees such as thick pork chops, prime rib that hangs over the plate, steaks and chicken – accompanied by beer, wine or a cocktail. Breakfast is served family style: coffee, eggs, meats and biscuits with cane syrup. Although the lodge centerpiece is a remarkable trophy room featuring African big game taken by the original owner, Gene Bishop, other areas to relax throughout the lodge are populated by groupings of cushy easy chairs. Play pool, watch TV, read or grab a stool at the fully stocked round bar, Southern Woods is unpretentious, comfortable and immaculate. Ella and Misty on point at Southern Woods Plantation. There’s an abundance of quail in the managed habitat, with some of the pine trees dating back 100 years. 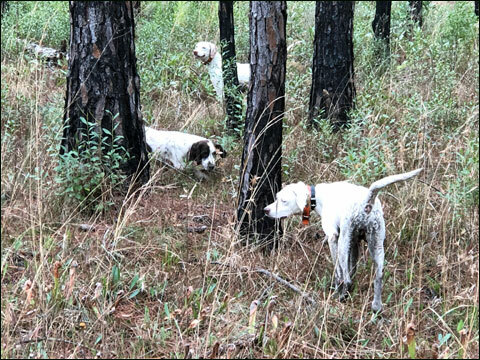 The hunts are guided by local boys whose families have been breeding and training bird dogs for generations. We moved around the quail courses in Jeep-drawn bird buggies. Mr. Lewis had arranged for a split hunt. We arrived for lunch, hunted afterwards, back to the lodge for pre-dinner cocktails and then on to dinner and conversation. The following morning started with a big breakfast, another hunt and then returning to the dining room for lunch. After a dessert of pecan pie, the group dispersed to their homes throughout the U.S. and Canada. 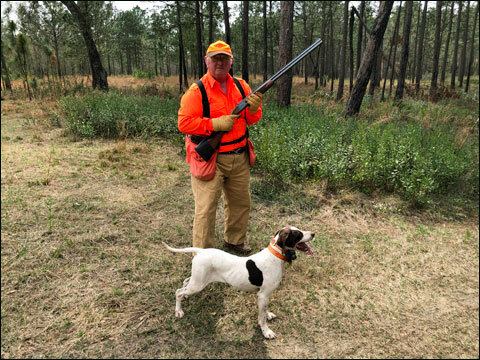 On the second day of the bobwhite quail hunt at Southern Woods Plantation, the author shot this Kevin’s Plantation 20-gauge side by side. Our afternoon hunt was taken under a forecast of rain. 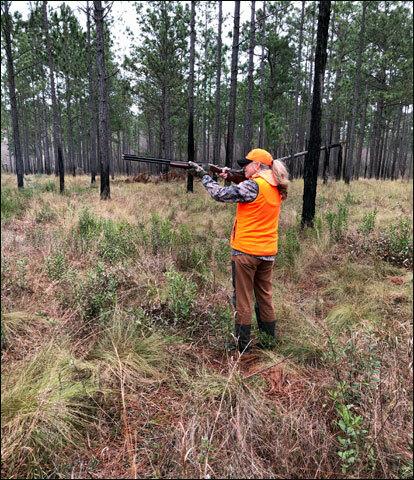 I had brought a 20-gauge Beretta A400 Xplore semi-auto, which was up to the threat, and in fact we had to stop hunting for about 20 minutes as the edge of a fearsome storm dropped some rain. 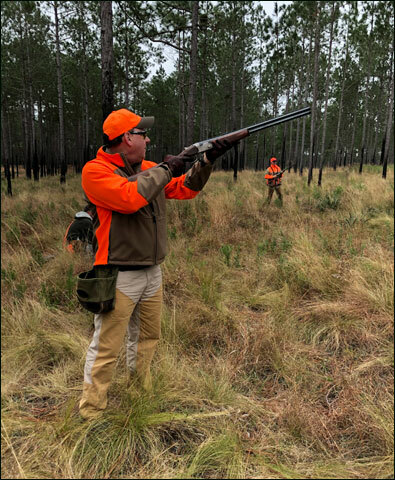 The next morning, the weather downright pleasant, I carried a Kevin’s Plantation 20-gauge side-by-side that was a joy to shoot. The Fellowship Opportunity hunt was a classic in so many ways. Men who had been volunteering with DU and hunting together for 30 years clearly savored each other’s company as memories flowed at the bar and over meals. I had hunted with two groups that were gracious, fun and excellent shots. By every measure, it was in fact a Fellowship Opportunity. 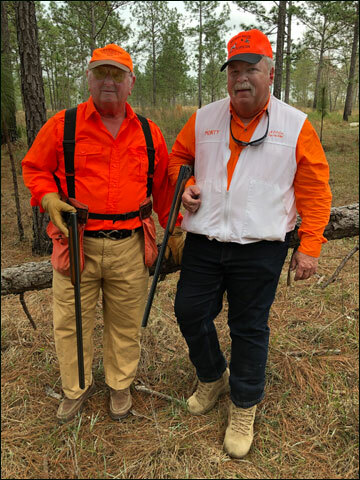 Richard Kowallik (left) and Monty Lewis have been hunting together for decades. At Southern Woods Plantation, the author goes for a double. 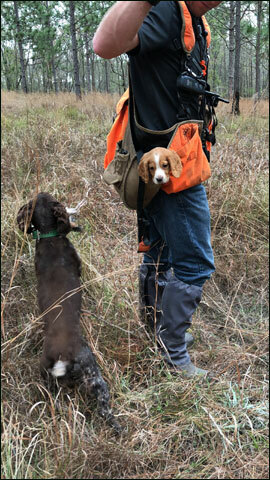 Southern Woods Planation guide Cash Lowry carried his five-week-old English Cocker, Honey during one of the hunts. Richard Kowallik in the field. Jan Young slammed a bunch of quail during the DU/DU Canada hunt at Southern Woods Planation. 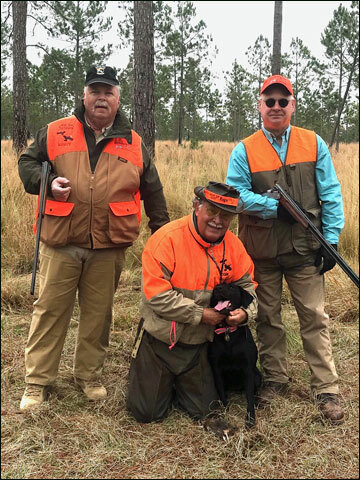 Joe Mazon (foreground) and Bill D́Alonzo during the DU/DU Canada hunt at Southern Woods Planation. Some of the great dog work we experienced at Southern Woods Plantation. 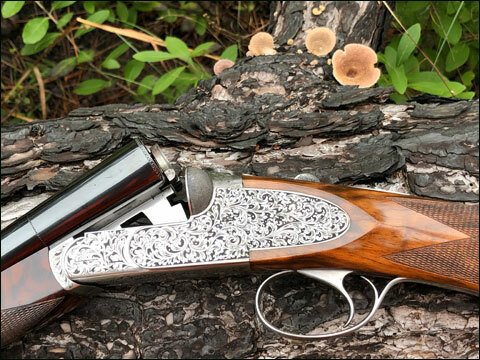 At Southern Woods Plantation, Monty Lewis exclusively shoots a .410 Kevin’s Plantation over/under. 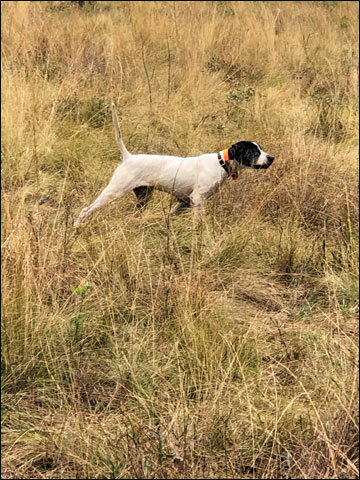 If you want to watch a master of the .410, hunt bobwhite quail with Monty Lewis. Irwin Greenstein is Publisher of Shotgun Life. Please send your comments to letters@shotgunlife.com.